Jupiter is the planet of opportunity: the bringer of good luck; overseer of our particular fortune in the world; and guide on whatever particular path we travel searching for wealth and opportunity. Every astrologer knows this; however, this is not the only function of Jupiter: he is also the wise teacher, the planetary guru who shows us how to grow into the souls we were born to be, helping us to learn the key lessons we were meant to learn. Every twelve years, as planet Jupiter returns to our natal position, an opportunity arises for us to gain a deeper appreciation and understanding of the lessons in our lives. By looking ahead and gaining a better understanding our upcoming Jupiter returns, we can obtain, before they occur, a better grip on life's lessons, and thus go through our transitions with our eyes more fully open. Here, in concise and yet complete format, is a full-life report on Jupiter (the planet of direction and opportunity) written by master astrologer Sam Reynolds, a well-known astrologer who has extensive counseling experience. Not only does Reynolds cover all of the standard astrological factors (Jupiter in sign, house, and aspects) but he also goes on to detail the key times that Jupiter returns over the next 84 years of your lifetime, thus revealing what lessons you are here to learn and acquire understanding from, at what age you might be facing striking challenges, and what strategies or rituals might be available to help you manage these challenges. The Jupiter Report provides details on seven complete Jupiter returns, including dates, with extensive written interpretations correlating each date. This is, essentially, a lifetime's "Jupiter journey" contained within a single report. 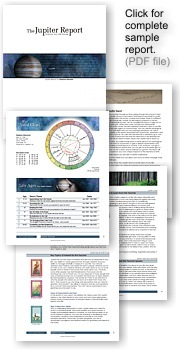 Moreover, like many of the newer reports from Matrix, the Jupiter Report includes a complete set of Astro*Images (tarot-like astrology cards) which can be turned on or off at the touch of a button. Many clients, new to astrology, find these cards and their visual clues very helpful in setting a mood conducive of understanding. Samuel F. Reynolds is a practicing astrologer in the heart of Brooklyn, New York. He has trained with some of the most notable minds in the astrological world, including Alan Oken, Robert Zoller, and Christopher Warnock, all of whom helped him obtain his Level III certificate from NCGR in 2004. He writes for numerous online publications, including aol.com and tarot.com, and for various print publications as well. He has been a speaker at National Astrology Conferences: Moses Siregar's Blast Conference; the International Society for Astrological Research�s National Conference; and the State of the Art Astrology Conference in Buffalo, NY -Autumn, 2009. Samuel provides astrological counseling for Robert Currey's, Astro*Live*Link, a British-based dial-in service dedicated to astrological counseling for people throughout the English speaking world. He has hosted, on weekends, "The Zodiac Lounge," a NYC-based spiritual bazaar, where he brings together various healers and seers to serve in economically challenged communities. Additionally, he is co-founder of the Astrology Career Institute (www.astrologycareerinstitute.com), which provides students with the resources and marketing tools to become practicing astrologers themselves. Astro-Images can be turned on and off at your discretion. Report looks at transit hits to the synastry chart. Reports includes for: transiting house, transiting sign, progressed house. An average The Jupiter Report reading will run from 10 to 30 pages, dependent upon numbers of weeks selected. Reports print nicely formatted in PDF format on screen to review, or save to file for e-mailing. The Jupiter Report is a complete program that will function as a stand-alone or in conjunction with other Matrix programs. Reports in the Win*Writer Professional collection work within the same user window making it easy to produce multiple reports quickly and efficiently either individually or in convenient batches. Includes complete ACS U.S. and International atlas with more than 258,000 world locations, precisely plotted and timed. These programs offer user-defined settings that allow you to tailor reports according to your own personal taste and preference; batch processing is available, for example, your own graphics, a personal logo, contact information and much more�the choice is yours! These reports give you the same precise astrological calculation and in-depth interpretation as is found in the Professional software; they do not, however, offer the user-defined options available in those more advanced report-writers. The Jupoter Report Advanced Natal professional report software. Part of the WinWriter collection: Advanced Natal Report software The Jupoter Repor. The Jupoter Report create beautifully formatted reports, ready to deliver or e-mail to your customer or client!